Much like Putin’s Russia, Venezuela has been unfairly victimized by Washington’s foreign policy elite and savaged by the Western MSM, which have caricatured Chávez as a run of the mill Latin American populist strongman. In a previous post on this matter, I drew attention to the work of Mark Weisbrot at the CEPR, who has demolished these crude myths (The Venezuelan Economy in the Chávez Years). Under the Bolivarian regime poverty plummeted, access to high-quality healthcare, education and affordable food widened and the GDP skyrocketed by 94% from Q2 2003 to 2008. Unable to criticize Venezuela on humanitarian grounds, the only option left open to the neoliberal ideologues was to claim that the Venezuelan economic miracle was nothing more than an ‘oil boom headed for collapse’. Unfortunately for them, the Venezuelan state kept a balanced budget, reduced its foreign debt from 47.7% of GDP in 2003 to 24.3% in 2007 and total interest on all public debt amounted to just 2.1% of GDP in 2006 – overall, a fiscal policy far more responsible than Washington’s itself. For 2008, the government assumed an oil price of 35$ per barrel; it is true that in practice the state spends beyond budgeted expenditures when oil revenue far exceeds the budgeted for price, so a fall in oil prices would trim government spending and growth. However, a budgetary crisis or economic downturn are very unlikely, since the government has more than 50bn $ of international reserves it can draw upon in a crisis. That was the theory when Weisbrot published the paper in February 2008…but how does it stack up in the face of 50$ per barrel today? 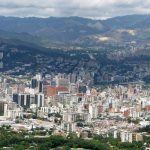 In November Mark Weisbrot published another article, Oil Prices and Venezuela’s Economy. In the brief introduction, he reiterates the points made above and mentions that since US-Venezuelan economic links are weak, by far the most important direct external effect of the global economic crisis on Venezuela is the effect on oil prices, since that commodity accounts for 93% of its exports. The key question is how far oil prices must fall before the country begins to run an unsustainable current account deficit. 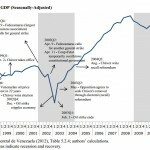 (The current account is mostly the trade balance plus several other things like debt service payments, and is the main binding constraint for all developing countries since they cannot borrow as much, relative to their GDP or for as long, as developed countries with ‘hard currencies’, to meet their import needs. The central government budget can be covered in the local currency so it’s not as important). Weisbrot begins by looking at various export scenarios. He assumed that the 7% of non-oil exports remain a constant 6.5bn $ per year. After verifying PDVSA’s (Venezuela’s national oil company) export volumes, he took that as the high case (2.89 mbd) and after subtracting half the 0.54mn barrels exported on favorable terms to friendly nations under the PetroCaribe program, took the latter figure as the low case (2.62 mbd). As we see from the table above, exports remain respectable at 63.9bn $, even at 66$ a barrel (WTI-adjusted), whereas ‘estimates from Goldman Sachs, Merrill Lynch, and the International Energy Agency predict WTI prices of between $80 and $100 per barrel for 2009’. 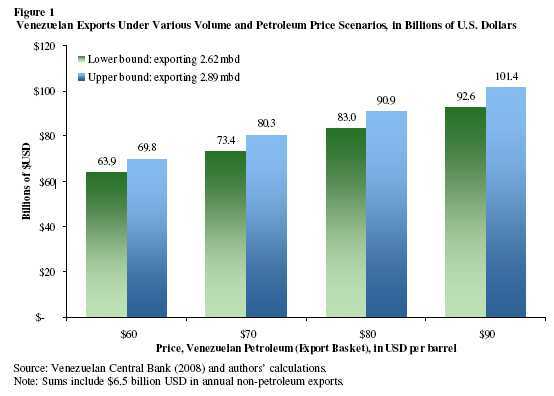 Venezuelan annual exports under various oil price scenarios. (Above prices are for Venezuelan oil, which typically sells for 10% less than West Texas Intermediate). 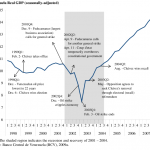 Imports for 2008 are currently at an annualized 43.2bn $. Considering that this year did see a price spike, the average oil price for the whole year should remain at around 90$, thus providing about 90-100bn $ of export revenue and yielding a massive trade surplus of 50-60bn $ (or around 15-18% of GDP). 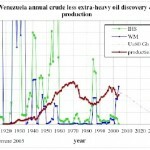 As seen from the scenario above, Venezuela will almost certainly avoid a trade deficit in the next few years (let alone experience a balance of payments crisis), even if oil drops to and stays at 50$ per barrel – a highly unlikely outcome that would probably only come to pass in the event of a full blown global Depression. Adding in interest payments on the sovereign debt does not change the big picture, since they currently only make up 2.2% of annual GDP. Even if, contrary to all expectations, the oil price remains at 50$ per barrel and Venezuela racks up a small current account deficit, it can be easily mitigated by the Central Bank’s 40bn $ of reserves and 37bn $ in other hard currency assets, which together make up a 23% of GDP cushion which ensures that any landing will be a soft one. In conclusion, Venezuela will retain a long-term current account surplus under almost any plausible scenario. Since the government controls access to foreign exchange, import growth can be limited as a last resort. Weisbrot recommends the Venezuelan government to pursue an expansionary fiscal policy, including deficit spending, so as to maintain economic growth and prevent unnecessary falls output and employment (just like the counter-cyclical measures the Chinese are now taking). Inflation should not be a problem, since it will be countered by deflationary forces due to the decelerating global economy (e.g. lower food prices). Not only is Venezuela very far from collapse, to the incipient chagrin of schadenfreude-indulging neocons; the fiscal prudence Chávez wisely followed during the fat years will now enable Venezuela to pursue growth in the midst of Anglo-Saxon paralysis. NB: in other recent work, Weisbrot takes issue with those who think Argentina is going to default on its debt, as it did in 2002. He also has a pessimistic take on the US economy and foreign policy – it’s key points are a) the housing bubble is still far from wound down, b) expects a retreat of neoliberal dogma in the next few years, c) notes that the IMF has lost practically all leverage with respect to middle-income countries, d) US power and prestige have been in retreat throughout Latin America, which has seen a political ‘left wave’ and dissilusionment with the Washington Consensus, e) there is a continued and disturbing lack of understanding of Latin America by Washington’s foreign polic elite, in particular towards Venezuela, f) hopes that the Democratic base will exert influence on foreign policy, in particular removing America’s sense of messianic exceptionalism and g) “Americans may finally begin to see themselves as having to choose between fighting to defend an empire in decline, and enjoying the quality of life – including such amenities as universal health care – that their counterparts in other rich countries have”.